When the Metrocard made unlimited rides possible it also made daylong excursions on various subway lines economical. The formula typically includes six walks and six rides along a line with a lunch break in a food-rich neighborhood. The #7 train, which had already been dubbed “The Orient Express” and “The International Express” was the first of these tours and an instant success. These daylong excursions can be modified into two to three hour tours by selecting three of the neighborhoods listed. In 1999, the Flushing Line was designated a National Millennium Trail (along with the Appalachian Trail and 14 others) by a joint program of the White House Millennium Council, the United States Department of Transportation, and the Rails-to-Trails Conservancy. It was chosen as a representative of the immigrant experience, and because the approximate path of the Flushing Line has been in continuous use as a transportation route since the 17th century. We tour the transportation corridor between Grand Central Terminal and Flushing, learning what the IRT #7 did to and for the communities in its path. Commentary encompasses colonial settlement patterns, demographic history, revolutions in transportation and industry, major public works projects, “Garden City” experiments, contemporary ethnicity, and food. Long Island City-Sunnyside-Flushing-Corona-Woodside-Jackson Heights Lunch in Flushing’s Asiatown. The first subway in New York City opened in 1904 and went from City Hall to Grand Central then to Times Square and finally under Broadway to W.145 St. (now today’s #6, shuttle, and #1 lines) Commentary along this route stresses 20th century changes wrought by this new form of transport: early skyscrapers, department stores, theaters, college campuses, transportation junctions and much more. City Hall-Madison Square-Grand Central-Times Square-Morningside Heights-Hamilton Hts. Lunch in the Grand Central Food Court. The extension of NYC’s first subway line under Lexington Ave and into the Bronx served the wealthy “Gold Coast” as well as the poor of Yorkville and East Harlem. As an elevated train east of the Bronx River, it propelled the transformation of the rural East Bronx into an urban landscape. Commentary includes physical geography (the Harlem Valley and the Harlem and Bronx Rivers), colonial Bronx settlement, and planning. Upper East Side/East Harlem-South Bronx-Westchester Sq- Parkchester-Bronx River-Harlem River. 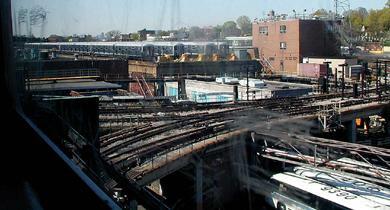 The J, and L trains, the New York Connecting RR, and storage yards converge at Eastern Parkway/Broadway Junction. Originally built as an excursion railroad to Coney Island, the Brighton line quickly became a conduit to early suburbia before being converted to a subway line. The route is rich in history, ethnic contrasts (black, Jewish, Chinese, South Asian, and Russian) as well as leafy garden suburb developments. We also visit the Flatbush town center and the boardwalk in Russified Brighton Beach. Prospect Park-Church Ave-Brighton Beach-Avenue U-Avenue J-Avenue H. Lunch in Brighton Beach. The #4 train (Jerome Avenue line) mostly navigates a valley between the ridge of the Grand Concourse on the east and the bluffs over the Harlem River to the west. More than a century ago, this part of the Bronx was the Northside of NYC, way “uptown”. The hilltops are the site of beautiful college campuses, parks, reservoirs, and remnants of housing for the wealthy, much related to the nineteenth century. Near the subway stops, there is new commerce relating to new ethnicities. Dominating features like Woodlawn cemetery, Yankee Stadium, and the Cross Bronx Expressway continue to impact the area. Mott Haven-Fordham-Jerome Park-Woodlawn-University Heights-Tremont. 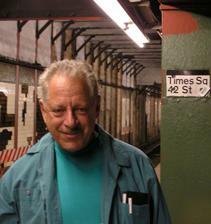 Since its expansion to 8th Avenue in Manhattan in the 1930s, the L line has stimulated gentrification along its route. We can explore the West Village and meatpacking district— including a portion of the new Highline Park— and on to the East Village , Williamsburg, East Williamsburg, Bushwick And Ridgewood noting the continuous transformation of each of these neighborhoods.